Our pictures were taken at the Geneva motorshow, but this car was first shown at Tokyo’s show last year. That is a Suzuki Swift (not sold in the US), a very small car, a bit smaller than a Toyota Yaris, more low-key too. It has been in production in this form since 2006, and we’re expecting a new generation in a few months. But this concept had another goal: to showcase Suzuki’s credentials in plug-in hybrid technologies. 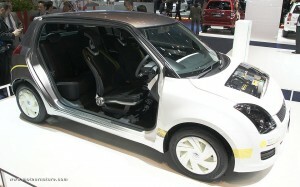 Suzuki is not well-known among hybrid fans, but it was selling an hybrid model in 2003, the Twin. Even smaller than the Swift, that was a Japan-only model, which was successful in its gasoline version, but much less with its hybrid drivetrain. Its production was stopped barely 2 years after its introduction. 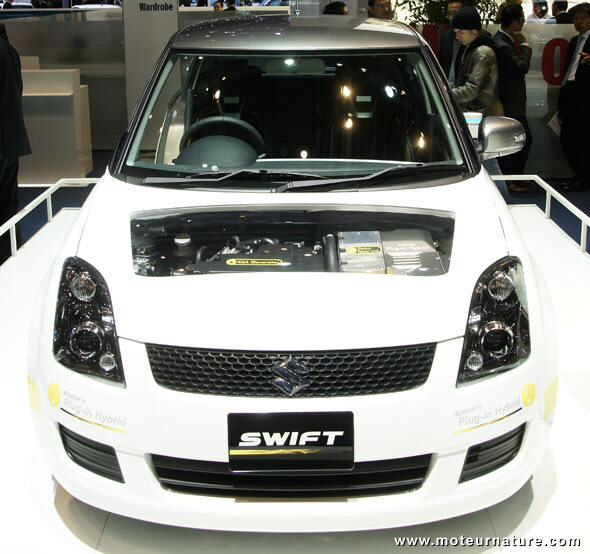 Of course, Suzuki is more cautious since then, and there’s no plan to put this Swift plug-in hybrid to market. Still, Suzuki had managed to get road-approval for it. So the japanese manufacturer will build a few of them, and put them into the hands of good customers. We can expect 40 to 60 cars, in Japan only, at the end of this year. This car has a 0.6 liter 3-cylinder gasoline engine making 54-hp, in a serial hybrid configuration, to generate electricity for a 55-kW (74-hp) electric motor, via Sanyo batteries. Sounds great, but there is one thing wrong: the small capacity of the battery pack. A full charge gives only a 15-km range. That’s 9-miles! Is there a market for a plug-in hybrid with such a limited range? Are there customers willing to pay for the cost of added technology with so little use? With that in mind, there’s no doubt that this is only a test. But that is not the only reason for this. Actually, Suzuki might never sell a plug-in hybrid, nor an hybrid, nor an electric car that it would have developed all by himself. Because these new expensive technologies were the main reason behind the partnership with Volkswagen, established last year. Future Suzuki hybrids shall use drivetrains coming from Volkswagen, or at least co-engineered with the germans. That is not the case of this Swift.